[MARCH 7, 2000] Restoring merry-go-round horses may be an unusual way to make a living, but it suits John Sutton. At least, it has for the past 10 years. 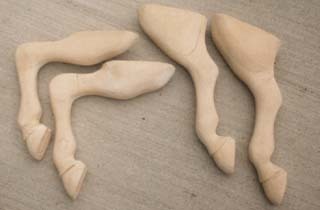 In his Lincoln workshop, scarred and battered wooden horses, some minus ears, tails or legs, will once again become the brightly painted prancing steeds that delighted the hearts of children years ago. Today, however, when they are restored to their former glory they will delight the hearts of collectors. They sell for prices of $5,000 to $7,000 for small horses and from $20,000 and up for bigger, more elaborate and rarer pieces. 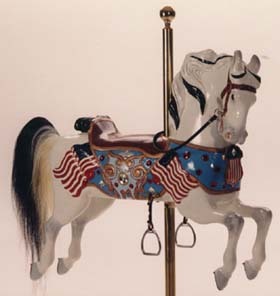 The carousel horses children ride now are usually made of aluminum or fiberglass, John says. "Only a few carousels still have wooden horses. There’s one in Indianapolis at the Children’s Museum. Anyone can ride it, adults or children, and I think the price is still 25 cents." 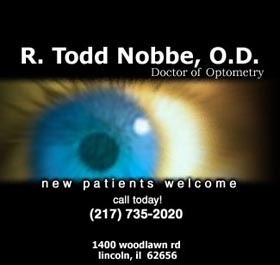 When the Illinois Department of Mental Health began moving residents out of the Developmental Center, he worked for a while for the Department of Corrections. "I was workshop supervisor and also in charge of leisure time activities. It gave me a lot of good teaching opportunities." 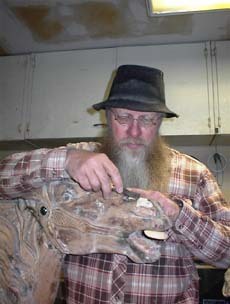 He enjoys restoration, and before he started working with carousel horses he restored buggies, wagons, sleighs and hearses. Among his other occupations have been chair caning, clock repair, sign making, selling monuments, and fine woodworking and carving of various kinds. He’s a dedicated member of the Possum Holler Pickers, an old-time music group that will be holding a free jam session on Saturday at the Lincoln Recreation Center. John will be playing the mandolin. The Possum Holler Pickers started years ago as a dulcimer group with MeLane Coulter and her brother, Kevin Beatty, from the settlement once called Possum Holler, between Middletown and Broadwell. All three of them played dulcimers. More and more people joined, until there were eight to 10 members. "We started branching out and fiddling around," he says. "We are always trying something new." The original group is now two, a dulcimer ensemble called Prairie Aires and the present Possum Holler Pickers. "Our group got into old-time country, which was what I grew up on. That’s country without electric instruments and no rock influence. We are also doing bluegrass, which is a different style but with the same instruments and sometimes even the same songs." The pickers play at church suppers, for nursing homes, wherever they are asked. "If someone wants to pay us, we’ll take what they give us, but we will put the money back into the community. That’s what our March 11 concert is. We rent the place and buy some food, although anybody can bring a potluck dish. Everybody can come, no charge, and play sing, listen and eat with us. That’s how we give back to the community what they gave us." 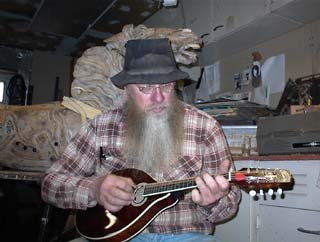 Present members of the Possum Holler Pickers include Kenny Harris, rhythm guitar; Manny Gaston, banjo; Darryl Wibben, lap dulcimer; Dale McRoberts, guitar; Lynnette Belcher, bass; Tanya Conrady, bass; and Maureen Douglas, fiddle. Others may sit in from time to time. As well as being an artist and a musician, some people call him a philosopher. He’s not so sure, but he does say this: "If you think at all, you’ve got to come up with something. You don’t always know how sound it is or how valid." If philosophy includes a sense of humor, he certainly qualifies. About the variety of jobs he’s held, he says: "If you’re in a job too long, you don’t want anything to upset the apple cart because then you might have to do some real work. Right now I’m trying to wean myself off food and shelter so I can stop working." The values he lives by are summed up in the first two commandments. "If you truly love your neighbor as yourself, you won’t raise yourself higher than your neighbor. The higher you raise your neighbor, the higher you can go." One way John "raises his neighbors" is by lending a helping hand whenever he sees a need, whether it’s buying groceries for a senior citizen who can’t get out, fixing a neighbor’s bicycle or helping somebody draw up plans for a shed. If a friend just needs somebody to tell his troubles to, John is ready to sit and listen. A lifelong Catholic, he attends Mass every morning at Holy Family Church. "It starts me out pointed in the right direction," he says. After Mass, he’s off to breakfast at the Arcade Restaurant with a group of friends. "We have a broad range of experts on everything," he notes. "We solve all the world’s big problems at breakfast. Then I come home and take care of the menial stuff." Sutton also enjoys local history and knows a lot about Lincoln and Logan County. Abraham Lincoln, who was once a surveyor, laid out Postville, he points out. He also knows why Union Street got that name. "It’s the street that joins Lincoln and Postville." In addition, Sutton is a member of Lincoln’s Logan County Arts and Craft Guild, a volunteer group that demonstrates arts and crafts of the 1800s at local events such as the Railsplitter Contest and the annual Postville Festival, held in conjunction with the Balloon Fest and Art Fair. For these demonstrations he’s made treenware, wooden kitchen utensils such as spoons and forks, and a mortising machine that makes square holes using foot-power. He’s often seen around town riding his bicycle or hiking along the railroad tracks, and he doesn’t worry about what he’s wearing. "How I look is not one of the most important things in my life. One day I went to the Arcade and all my clothes matched. People asked me if I was sick. I said, ‘No, it’s just the luck of the draw.’"
Years ago, while on vacation, he decided not to shave. "It dawned on me that for some reason, a man has a beard. God wanted it that way. I used to trim it up but finally I thought, why go to all that trouble?" He doesn’t worry, either, about acquiring things. "I got to the point where I found out what was sufficient was enough. It takes all the pressure off, knowing there are a lot of things I don’t have to have and I don’t have to keep up with anybody." Sutton’s not very keen on competition either. "I’ll play games but I don’t want to keep score. Why don’t we just have fun? Why can’t we both win?" His enthusiasm for bicycling led him to work on a committee to lay out bicycle trails for Logan County riders. An east-west trail will link Chestnut, Mount Pulaski, Elkhart and Middletown. A north-south trail will link Williamsville with McLean. The ultimate goal is to connect Lincoln with Springfield and Bloomington’s bike trails, perhaps even getting as far as Pontiac on the north and Carlinville to the south. Most of the trails will be on existing roads, but the committee wants to be sure there are signs indicating these roads are also bike trails. "Then motorists hopefully will run us over at lower speeds," he says. Back in his workshop he has books explaining the history of the companies who made merry-go-round horses, and he can talk at length about the different types and styles. Small, sturdy horses were made for carousels that went to country carnivals and had to be moved from place to place regularly. These used construction details that wouldn’t break, ears laid down or even detachable, legs in parallel so the horses could be stacked close together for moving. Larger, more elaborately carved animals were made for machines that stayed in one place, such as an amusement park. These carousels might have 50 or 60 animals with ears that stood erect and flying or "peek-a-boo" manes with three or four holes in them. "Of the two major types, there were many styles," he explains. "There are standers, prancers and jumpers. In any one of those you can have a variety of other details. You can have the heads tucked down or you can have stargazers, with the heads looking up. You can have wooden tails or horsehair tails." Ron Craig, the head of maintenance at Lincoln College, is in business with Sutton. Craig does the locating, buying, selling and trading and Sutton does the restoring. 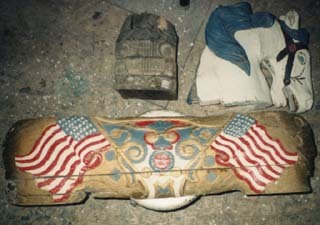 The first step is to take the horse to pieces; then repair each piece individually. "Everything comes apart, just like you’d restore an old Model T," Sutton says. It doesn’t worry him that he has a bucket of legs here and a pile of ears there. "You know what goes on what horse. You know the hoof of a Hershell-Spillman just like you’d know a taillight from a Model T."
If part of the horse is missing, he recreates the piece, maybe a neck or a pair of legs, puts it all back together, smooths it out and finally paints it the way it used to be. "We mix our own paint. Ron knows the exact colors." The rarest and most expensive piece he ever restored was a standing donkey. "We signed a waiver for $20,000 when it was in a junk state, and we insured it for $55,000 when we sent it back," he recalls. Sutton moved to Lincoln in 1966 and can’t see any good reason to leave. "I’ve got friends, freedom and what I do for recreation. I hike and bicycle, ride my motorcycle and fish, draw, carve, pick and grin, grow veggies and flowers. I’ve got most of my rainbows." Editor’s Note: The Possum Holler Pickers will hold an Old Time Music Jam on Saturday, March 11, from 2 to10 p.m. at the Lincoln Recreation Center, Primm Road. Area musicians are invited to bring acoustical instruments and sit in with the various groups. A potluck meal is set for 5 p.m. Soft drinks will be provided. No alcohol is allowed.